Make sure that if your variable properties are stored with ’ quotes around them, your @if statement checks that too. (e.g. $other ==‘single’). if statements can be useful for mixins for checking variables or in libraries to include or exclude code. Mike is a front-end developer for Brighton agency Liquid Light. 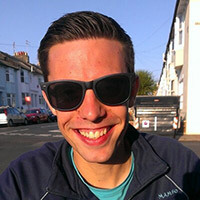 When not writing copious amounts of CSS he can be found cycling with around Sussex or making an arduino blink.